Uploading a spreadsheet of your opted-in contacts is as simple as a few clicks. We know Excel can be confusing, so if you're having trouble check out this quick step-by-step guide to preparing your contacts for uploading. 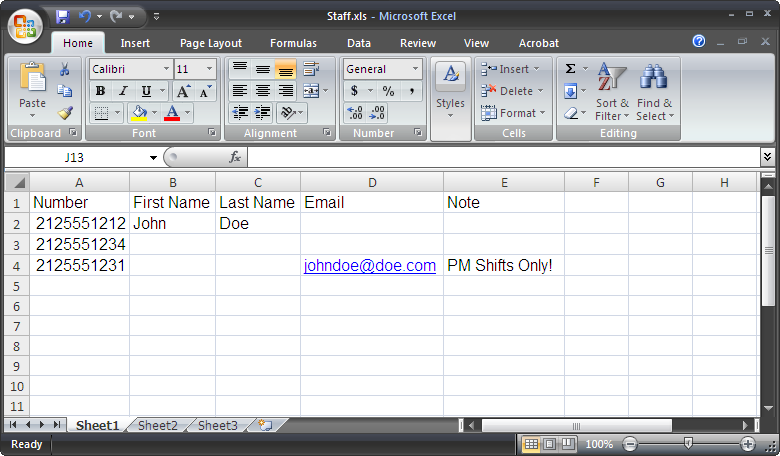 Chances are your spreadsheet of contacts is a Microsoft Excel file (on a PC it will end in .xls for most versions of Excel and .xlsx for Excel 2007). We can accept XLS, XLSX and CSV files, so if you're not using Excel, just make sure to convert your spreadsheet to a CSV. Each row represents a single contact. The first column must be the Phone Number, followed by these four optional fields (in this order): First Name, Last Name, Email, Note. Your file is ready to upload. Login to your account and click Upload Contacts. On the Upload Contacts page click browse and choose your XLS, XLSX, or CSV. Choose the Group you want to add the contacts to, or create a new Group on the fly! Once you're ready, click Add Contacts. We'll handle the rest.